Once upon a time there was a poker player who got very tired of always getting the lowest cards in his hand. So he came up with a new poker game. Deuces Wild! Deuces Wild means you can have two times the FUN playing this poker game! 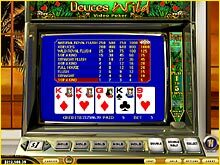 The name of the game Deuces Wild refers to the fact that the deuces in the pack (those cards with a face value of 2) can stand in for any other card of any suit. It's like having 4 jokers in the pack! Whenever you get one or more deuces in your final hand, the computer will automatically assign a suit and value to it to give you the highest possible payout in light of the other cards that you are holding. This ensures that it is a lot easier to create potentially winning hands. Always check the casino site for their payout table. Sometimes payouts may vary slightly per casino.